Former Member of Parliament, R.L. has been convicted by the Court in First Instance on Wednesday August 24, 2016 to a one (1) month jail sentence, fully suspended, for illegal firearm possession. R.L was acquitted by the court of charges against him for threat. R.L. was charged in the Zeepaard and Sardine investigation by the Prosecutor’s Office with two counts of threat and possession of an illegal firearm and ammunition. Based on these charges the Prosecutor asked for a jail sentence of one (1) year of which six (6) months suspended , 80 hours of community service anda probation period of two (2) years. The National Detectives Agency investigators arrested R.L. on Thursday March 26, 2015 at his home. During a search of his home two firearms and bullets were found and confiscated. After several hours of questioning R.L. was released. R.L. who was a Member of Parliament at that time is also accused of threatening former United People’s (UP) party Member of Parliament Jules James on June 11, 2012. 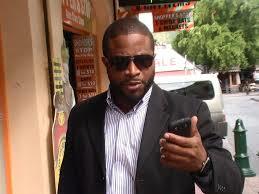 He was also accused to have threatened Isidore York on November 28. 2012.